Windows 10 is now installed on more PCs than Windows 7 in the U.S. and U.K.
Brett Morrison via Flickr. Click for original. Microsoft may fall short of hitting its goal of 1 billion Windows 10 installations within the first 2-3 years, but no matter how long it takes, the important thing (for Microsoft) is that the OS continues to gain ground. Certainly it has, with Windows 10 closing out 2016 by overtaking Windows 7 in market share in the U.S. and U.K. 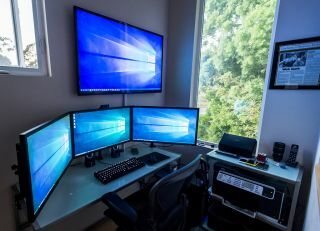 According to data from StatCounter, Windows 10 ended 2016 with a 26.9 percent share of the desktop and tablet market, up slightly from 26.35 a month prior and nearly double its 13.9 percent share at the beginning of the year. That was enough to edge ahead of Windows 7 by a smidgen, which dropped from 35.97 percent at the beginning of 2016 to 26.56 percent at the end of December. The gap between the two OSes is even wider in the U.K. where Windows 10 went from 18.42 percent to 31.02 percent over the course of 2016, versus Windows 7 declining from 30.21 percent to 21.49 percent. Windows 10 and Windows 7 effectively swapped places and the gulf will only get wider over time. These are small victories towards a bigger battle for OS dominance. On a worldwide scale, Windows 7 is still ahead with a 36.26 percent share of the combined desktop and tablet market, though it began the year at 42.65 percent. Meanwhile, Windows 10 widened its footprint from 12.47 percent to 24.49 percent in the same time period. A gap that was over 30 percent has been whittled down to less than 12 percent. It wasn't always inevitable that Windows 10 would overtake Windows 7 in any capacity. Looking back, Windows Vista and Windows 8 were both disappointing releases that never lived up to expectations, and neither one was ever on pace to dominate the market. Windows 10 is especially popular among gamers. According to Steam's hardware survey, over half of its users are running Windows 10 (64-bit and 32-bit combined). Part of that is undoubtedly due to Windows 10 being the only OS that supports DirectX 12. And of course offering Windows 10 as a free upgrade for the first year played a big role in all of this. What OS(es) are you running these days? And if you haven't upgraded to Windows 10 yet, do you think you will in 2017? Most importantly, how has Windows 10 been for you in terms of gaming performance?